Half Moon Cay was once Little San Salvador island in the Bahamas but was renamed by Holland America Line to honor Henry Hudson's small ship once featured on the Holland America Line logo. The flat, sandy island is spectacular, and passengers can enjoy the crescent-shaped beach and all sorts of water activities. It is located about 100 miles from Nassau, but this idyllic island is much different from the shopping and historical city. Half Moon Cay has a small straw market, an ice cream shop, and a few bars, but cruise passengers mostly head for the beach or sign up for one of the adventure-oriented shore excursions. These excursions include kayaking, parasailing, deep-sea fishing, horseback riding, personal watercraft riding, bicycling, hiking, snorkeling, and swimming with stingrays. Once ashore, passengers can also enjoy a lunch barbecue without having to tender back to the ship. Although Carnival Corporation and Holland America have developed a small part of Half Moon Cay, crossing it with trails and making it accessible to all via the island's tram, most of the island is an untouched nature preserve. Holland America has kept much of the island natural, while also developing one of the loveliest private islands in the Bahamas. These tenders based on the island can carry many more passengers than those on the cruise ships. They are also quicker (and easier) to board and disembark. Half Moon Cay is about a hundred miles from Nassau​ but is close to many of the other Carnival Corp private islands. Some beach-goers prefer to walk away down the beach to escape the crowds. Small touches like this old sailboat add to the nautical and beach theme at Half Moon Cay. 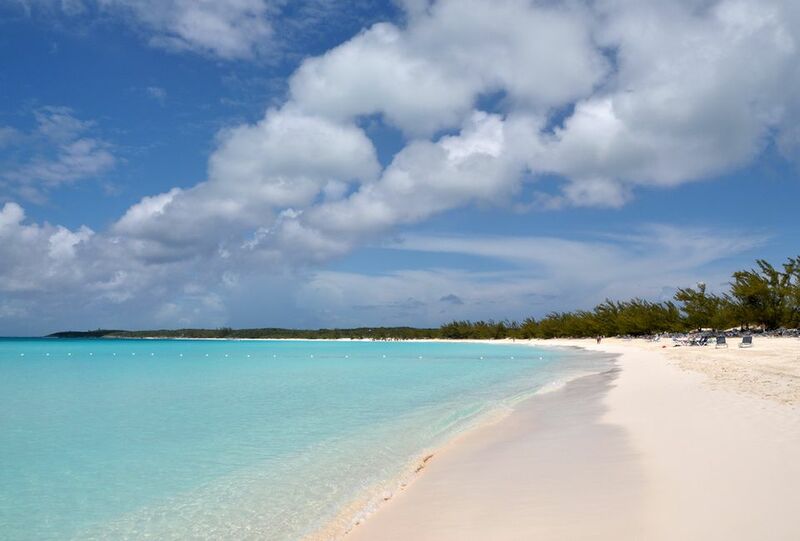 Holland America Line guests love the beach at Half Moon Cay! Tip: If you walk just a short distance down the beach from the tender drop-off point, you'll have more privacy. These navy blue "clamshells" can be rented by the day. They provide privacy and an escape from the sun. The Half Moon Cay beach is very busy near the bar, but you can move away from the crowd if you wish. It's not surprising that the beach bar at Half Moon Cay is popular with guests.